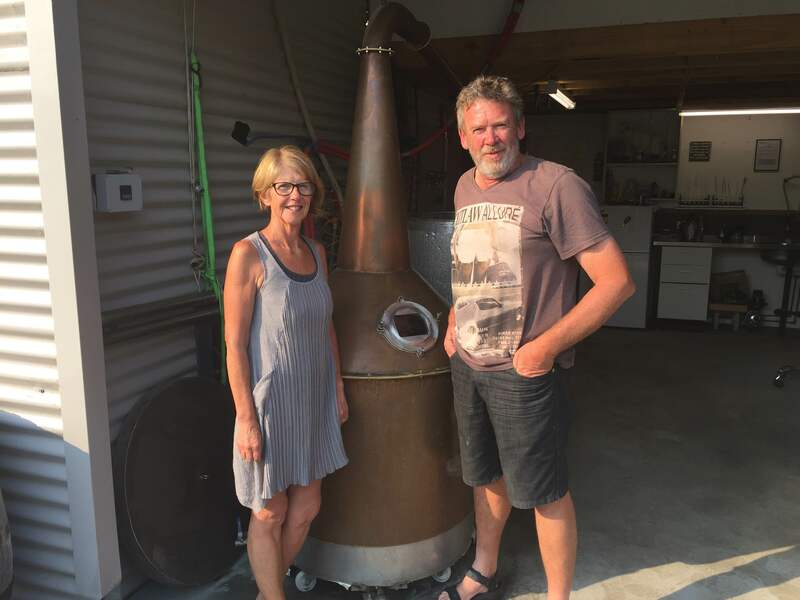 As self-styled whisky adventurers we get to meet some really fantastic people in the whisky business – case-in-point are Mathew and Julie Cooper, founders of the rather fabulously named Fannys Bay Distillery. Residing on Tasmania’s North coast they have brought whisky making to a region hitherto bereft of locally produced drams. As far as we (and they) know, Fannys Bay is Tasmania’s smallest distillery, but all indications suggest they will be punching well above their weight. 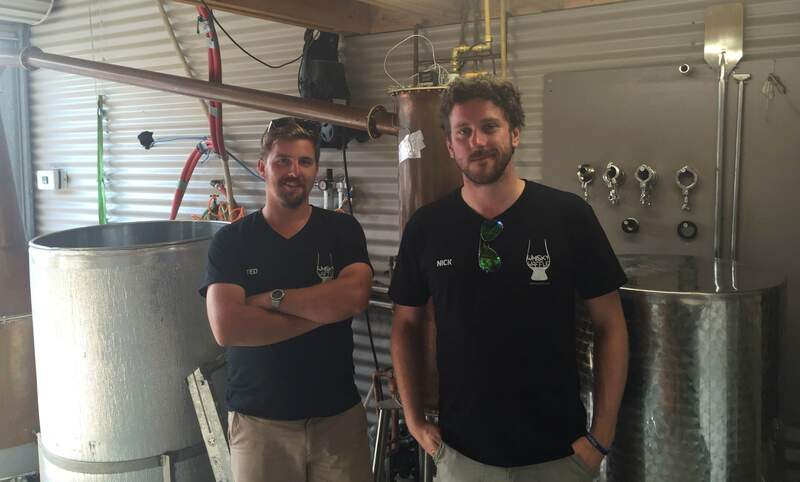 The Whisky Waffle boys travelled to the remote community of Tam O’Shanter to visit the Coopers on a sunny Sunday afternoon – or at least it would have been sunny if it were not for the thick smoke haze left by the bushfires. Mathew and Julie invited us into the shed to see where the magic happens, a location they both hope to spend a bit more time in this year as they have both recently retired. Mathew used to be a coordinator at the TAFE, though he has not quite left his teaching roots behind – regularly receiving visits from wannabe distillers (and semi-amateur whisky writers!). Julie told us that Mathew first had the idea to make his own whisky after trying some dodgy homemade stuff at a friend’s place. He woke up the next day with a sore head and thought “there must be a better way”. Being a very hands-on type of person Mathew built much of the distillery himself, including the gristmill and the still. Today in metalwork… Matt built a still. “To make a product how you want it, it starts with the basics,” Mathew told us as he enthusiastically filled a couple of glasses with new-make spirit – one made with Gairdener barley, the other with Westminster. The difference between the two was subtle but noticeable, with the former being richer and more floral, whereas the latter was lighter and more herbal. Both left us curious and excited about what Fannys Bay whisky would be like when mature. Unfortunately the oldest spirit had only been in barrels for 12 months and therefore cannot be called whisky for another year. Of course that didn’t stop us from having a small sample – for purely education purposes, naturally. We were presented with a pinot cask, a possible sherry cask, and a definite port cask, and were hard pressed to choose our favourite. Their aim to create an easy-drinking malt that appeals to a range of people is certainly looking on track. Take note people – in 12 months time Fannys Bay will be one to look out for. It certainly appears Tasmania is a hotbed of whisky innovation and industry. So I’m wondering, where do the casks come from? The Aussie wine industry? And what about the oak? That’d make an interesting post. Nice still, BTW. This is a very good question. There is no direct equivalent of oak here in Tassie, so all our barrels are made out of American or European oak. usually they are ex-bourbon or ex-sherry barrels that are re-coopered into smaller barrels. An increasing trend is to source ex-port or ex-wine barrels from south Australia or elsewhere in Aus which have been imported new from Europe for their initial use. This is what excites me the most – Starward in Melbourne are doing some interesting stuff with barrelling. Here in Tassie a bloke called Adam Bone is re-coopering a range of barrels for the distilleries – and doing a stirling job! Thanks for the question – it’s an area I’m rather interested in!